. All workers were washing hands with soap in both the processes. 48.48% and 90.52% of the workers were using hand gloves in the sodium dichromate manufacturing and chrome plating industry, respectively. Only 27.27% and 37.50% of the workers were using masks in the sodium dichromate manufacturing industry and chrome plating industry, respectively. No worker was using protective clothing or barrier cream in the sodium dichromate manufacturing industry. 40.65% and 12.50% workers were using protective clothing and barrier cream in the chrome plating industry. Conclusion: Workers engaged in sodium dichromate manufacturing and chrome plating are at a great risk of skin and mucous membrane disorders including chrome holes and nasal septum perforation. Protective measures and awareness of the management and workers about the exposure hazards and safeguarding against them will be useful public measures to prevent these occupational hazards among workers engaged in these processes. One of the most important uses of pure chromium is for electroplating for a wide range of equipment such as tools, plugs, rolls, drum dryers, chemical equipment, electric appliances, gears, food machinery, pans, and packing machinery. Sodium dichromate is used for dyeing, tanning of leather, and preservation of wood, and most of the chromium chemicals are manufactured from it. Health effects of exposure to chromium reported by various studies are eye, nose, and throat irritation, nasal septum ulcerations and perforations, gastritis, gastrointestinal ulcers, contact dermatitis, ulcers, and sensitization from skin contact. Hard chromium has been found to be associated with lung cancer and nasal and sinus cancers. Inhalation of dust and fumes arising during the manufacture of sodium dichromate from chrome ore, chromic acid mist emitted during electroplating, and skin contact with chromate produce hazards to workers. Skin ulcers are caused by penetration of chromates through cuts and abrasions, usually at the root of fingernails and knuckles of hands. These ulcers are circular in shape, the edge is raised and hard, the base is covered with exudates and look as if punched out; hence, the name chrome holes. Compounds of chrome also cause primary skin irritation and sensitization leading to dermatitis. Mucous membrane of the nose is commonly affected in which perforation of the nasal septum occurs. These perforations are preceded by ulceration. Irritation and rhinorrhea are the usual symptoms. To know the relationship of prevalence with the duration of exposure to chrome mist, dust, and fumes. The study was conducted among the workers engaged in sodium dichromate manufacturing and chrome plating from several industries situated near the Delhi-Haryana border in the districts of Faridabad in Haryana, India and Sonepat in Haryana, India from January 01, 2014 to December 31, 2014. The study population comprised workers who were doing work on chrome tank in chrome plating and workers engaged in any procedure for the production of sodium dichromate. All the workers from the concerned industries for the study were examined. A total of 130 workers comprising 66 workers from the sodium dichromate manufacturing industry and 64 workers from the chrome plating industry were examined. At the onset of study, the owner(s) or management of the factory was approached and their active cooperation was ensured. Further the workers were contacted and were explained about the study. They were requested to cooperate and in order to secure their cooperation, curative treatment for minor ailments was provided by the investigator and required cases were referred to the tertiary care specialized hospital for further treatment and follow-up. The study was conducted using a pretested schedule by direct interview and medical examination of each available worker. Questions in pro forma were intended to elicit the information regarding present history, occupational history (present and past), history of symptoms pertaining to the skin and nose, and history about the usage of protective measures. Age was recorded in the completed number of years as on last birth day. During the study, it was found that there were few workers who had worked in other industries in a similar type of job before joining the present job. Hence, the total duration was arrived at in these cases by adding the years spent in previous industries to the years spent in the present industry. Workers were interviewed for symptoms pertaining to skin irritation, rash, and ulcers while they were exposed to the present occupation. Similarly, workers were interviewed for symptoms pertaining to nose-like irritation and rhinorrhea, nasal bleeding, change in the character of voice, and loss of sense of smell. Lesions were graded as stage I (redness and congestion of mucosa), stage II (blanched and anemic mucosa), stage III (necrosis shown by the adherent crust), and stage IV (perforation stage)., Workers were also interviewed about the provision of protective measures such as hand gloves, mask, barrier cream, protective clothing, and their usage. A thorough clinical examination was performed on each worker and the findings were recorded in a standardized manner. The information thus obtained was entered in an Excel sheet and analyzed using Epi info 7 software. The study was conducted among workers engaged in sodium dichromate manufacturing and chrome plating from several industries near the Delhi-Haryana border in districts of Faridabad in Haryana, India and Sonepat in Haryana, India. The study consisted of interview with workers and clinical examination. Sixty-six and 64 workers were examined from the sodium dichromate manufacturing and chrome plating industry, respectively, and data regarding these workers were analyzed. All the workers were males and of the adult age group. It was observed from [Table 1] that the percentage of workers was more in the sodium dichromate industry as compared to the chrome plating industry with a duration of up to 5 years and vice versa with a duration of 10+ years. It was also observed that the number of workers decreased in both the processes with an increase in the duration of exposure. As evident from [Table 2], the most commonly found symptom was nasal irritation and rhinorrhea in both the sodium dichromate manufacturing industry and chrome plating industry. About 9% of the workers had nasal bleeding in both the industries. Only 6.06% and 3.12% workers had skin ulcers in the sodium dichromate manufacturing industry and chrome plating industry, respectively. No worker had irritation or rash in the skin, change in the character of voice, or loss of sense of smell in both the processes. Both the processes had similar risks with no significant difference. It was observed that 69.69% and 56.22% of the workers had disorders of the nasal mucous membrane, and 42.42% and 28.11% of the total workers had perforation of the nasal septum in the sodium dichromate manufacturing industry and chrome plating industry, respectively [Refer [Table 3] and [Table 4]]. Both the processes had similar risks with no significant difference. Nasal perforation was present in 22.22% and 30.77% of the workers with a duration of 0–5 years in the sodium dichromate manufacturing industry and chrome plating industry, respectively, as depicted in [Table 5]. 72.72% had nasal perforation with a duration 5–10 years in the sodium dichromate manufacturing industry while only 9.09% had nasal perforation In the same duration exposure group in the chrome plating industry. 50% had nasal perforation with a duration of 10+ years in both the groups. The duration of exposure was significantly associated with both the processes. Risk increased with increase in duration of years of exposure in both the processes. In chromium manufacturing industry, workers had nasal perforation with an exposure of 3–4 months and did not have perforation even with an exposure of more than 10 years. It might be due to the development of immunity if the first few months are passed without ulceration. It was observed that 90.62% workers were using hand gloves in the chrome plating industry while only 48.48% were using hand gloves in the sodium dichromate manufacturing industry. Use of gloves gave significance protection. 37.50% and 27.27% were using masks in the sodium dichromate manufacturing industry and chrome plating industry, respectively. 40.65% and 12.50% workers were using protective clothing and barrier cream in chrome plating while no worker was using protective clothing and barrier cream sodium dichromate manufacturing. Hand washing with soap was done by all workers in both the processes. The present study was conducted among the workers engaged in the sodium dichromate manufacturing industry and chrome plating industry. Objectives of the study were to find prevalence of skin and nasal mucous membrane disorders and to know the relationship of prevalence with the duration of exposure to chrome mist, dust, and fumes. With the above objectives, 66 and 64 workers were examined from the sodium dichromate manufacturing industry and chrome plating industry, respectively. 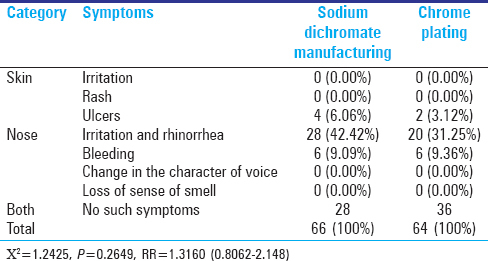 It was observed that nasal irritation and rhinorrhea were the most commonly found symptoms in both the sodium dichromate manufacturing industry and chrome plating industry, respectively, as shown in [Table 2]. Only 6.06% and 3.12% of the workers had skin ulcers in the sodium dichromate manufacturing industry and chrome plating industry, respectively. Similar results were reported by Sadhra et al., Kornhauser et al., and Budhwar et al. from their separate studies. There was no worker with symptoms of irritation or rash in the skin, change in the character of voice, or loss of sense of smell. It was observed that 69.69% and 56.22% of the total examined workers had disorders of the nasal mucous membrane in the sodium dichromate manufacturing industry and chrome plating industry, respectively, as shown in [Table 3]. There were 42.42% and 28.11% perforation of the nasal septum in the sodium dichromate manufacturing industry and chrome plating industry, respectively. Results were concordant with that of several studies conducted by Naik et al., Stren et al.,, and Lin et al. The distribution of workers according to disorders of the nasal mucous membrane and duration of exposure is shown in [Table 4] and [Table 5]. Perforation of the nasal septum was found in workers with an exposure of 3–4 months while it was not found in workers even with more than 10 years of exposure; so there is no obvious relationship of nasal septum perforation with the duration of exposure. However, Lin et al. found that the period of exposure was associated with adverse effect but Basketter et al. and Wash  explained that the threshold level was more important in occupational exposure to chromium. Variation in results of the present study was probably due to this fact. It was observed that hand washing with soap and water was done by all workers in both the processes as shown in [Table 6]. As per Petts et al., experience in working with toxic hazards in the industry would have made the worker more aware of the possible health hazards and protective measures. About 48.48% and 90.62% of the workers were using hand gloves in the sodium dichromate manufacturing industry and chrome plating industry, respectively No worker was using protective clothing or barrier cream in the sodium dichromate manufacturing industry while 40.64% and 12.50% used protective clothing and barrier cream, respectively, in the chrome plating industry. It was partly due to nonprovision of protective measures by the management and partly due to lack of awareness among workers about the usage of protective measures. The Health and Safety Network drew a conclusion similar to the Occupational Safety and Health Association (OSHA) and Rastogi et al. regarding the exposure to chromium. Workers engaged in chromium manufacturing and chrome plating are at a great risk of skin and mucous membrane disorders including chrome holes and nasal septum perforation. Protective measures and awareness of the management and workers about the exposure hazards and safeguarding against them will be useful public health measures to prevent these occupational hazards among workers engaged in these processes. Occupational Safety and Health Association. Controlling Hexavalent Chromium Exposures during Electroplating - OSHA fact sheet 2013. Washington: OSHA; 2014. Available from: https://www.osha.gov/SLTC/hexavalentchromium/. [Last accessed on 2015 Jul 10]. Naik SM, Naik MS. Nasal septal perforations - An occupational hazard in chrome industry workers. IJPMR 2013;1:13-5. Franchini I, Magnani F, Mutti A. Mortality experience among chrome plating workers. Scand J Work Environ Health 1983;9:247-52. Langård S. One hundred years of chromium and cancer: A review of epidemiological evidence and selected case reports. Am J Ind Med 1990;17:189-215. Sadhra S, Petts J, McAlpine S, Hattison H, MacRae S. Workers' understanding of chemical risks: Electroplating case study. Occup Environ Med 2002;59:689-95. Kornhauser C, Wróbel K, Wróbel K, Malacara JM, Nava LE, Gómez L, et al. Possible adverse effect of chromium in occupational exposure of tannery workers. Ind Health 2002;40:207-13. Budhwar R, Das M, Bihari V, Kumar S. Exposure estimates of chrome platters in India: An exploratory study. Biomarkers 2005;10:252-7. Stern RM, Berlin A, Fletcher A, Hemminki K, Jarvisalo J, Peto J. International conference on health hazards and biological effects of welding fumes and gases. Int Arch Occup Environ Health 1986;57:237-46. Stern AH, Bagdon RE, Hazen RE, Marzulli FN. Risk assessment of the allergic dermatitis: Potential of environmental exposure to hexavalent chromium. J Toxicol Environ Health 1993;40:613-41. Lin SC, Tai CC, Chan CC, Wang JD. Nasal septum lesion caused by chromium among chromium electroplating workers. Am J Ind Med 1994;26:221-8. Basketter D, Horev L, Slodovnik D, Merimes S, Trattner A, Ingber A. Investigation of the threshold for allergic reactivity to chromium. Contact Dermatitis 2001;44:70-4. Walsh EN. Chromate hazards in industry. J Am Med Assoc 1953;153:1305-8. Petts J, McAlpine S, Homan J, Sadhra S, Pattison H, MacRae S. Development of a Methodology to Design and Evaluate Effective Risk Messages: Electroplating Case Study. Contract Research Report 400/2002. Sudbury: HSE Books; 2002. p. 19. Rastogi SK, Kesavchandran C, Mahdi F, Panday A. Occupational cancers in leather tanning industries: A short review. Indian J Occup Environ Med 2007;11:3-5. Royle H. Toxicity of chromic acid in the chromium plating industry (1). Environ Res 1975;10:39-53.